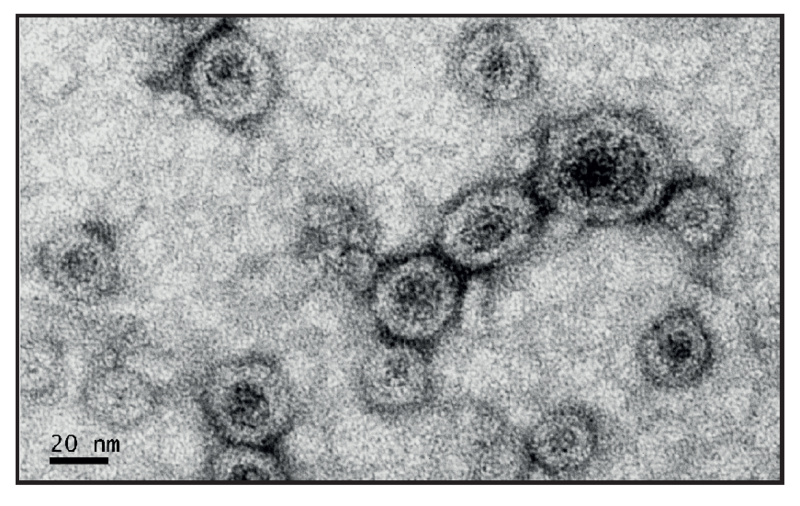 Outer membrane vesicles (OMVs) are small, spherical bodies secreted by Gram-negative bacteria, recently described as potent caspase 11-4/5 inflammasome inducers. They contain various pathogen-associated molecular patterns (PAMPs) such as lipoproteins and lipopolysaccharides (LPS; also known as endotoxin). These PAMPs initiate a myriad of immune responses through cell-surface receptors such as Toll-like receptors (TLRs)  as well as intracellular receptors, which leads to the formation of inflammasomes . InvivoGen's E. coli OMVs have been purified from Escherichia coli BL21 using an optimized procedure, importantly providing lot-to-lot reproducibility. Each batch of E. coli OMVs is thoroughly tested to characterize the OMV size and to ensure the activation of both TLR2 and TLR4 by the presence of lipoproteins and LPS, respectively. 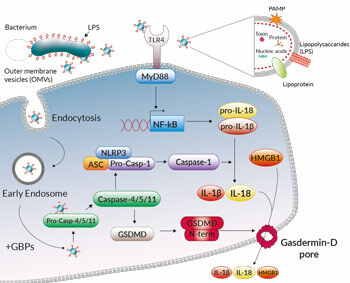 Importantly, activation of the caspase 11-4/5 non-canonical inflammasome is confirmed using THP1-HMGB1::Lucia™ cells, measuring the release of the alarmin HMGB1 due to inflammasome-mediated cell death. E. coli OMVs InvivoFit™ - recommended for in vivo studies. Specifically, E. coli OMVs InvivoFit™ are guaranteed sterile and have an endotoxin level >105 EU/mg of OMVs. (20 nm magnification seen to the left). 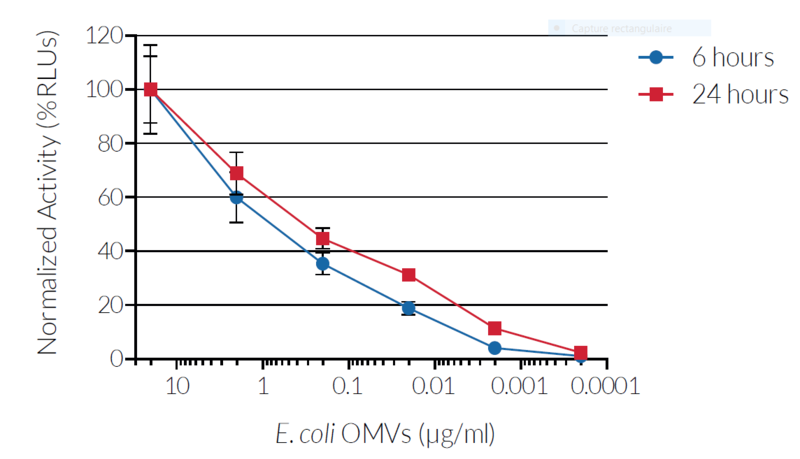 Figure 2: THP1-HMGB1-Lucia™ cells were incubated with 0.2 ng/ ml-20 μg/ml of E. coli OMVs for 6 (blue) and 24 hrs (red). After the incubation, Lucia luciferase activity was determined by measuring relative light units (RLUs) in a luminometer using the QUANTI-Luc™ detection reagent. Results are presented as normalized activity (percentage % RLUs). Figure 3: Bone marrow-derived macrophages (BMDMs) from wild type (WT) (blue) and caspase-11 knockout (KO) (red) mice were treated with a range of different concentrations (from 0.5 to 2.5 μg/250 000 cells) of E. coli OMVs (prepared in PBS) for 16-20 hours. After the incubation, the cell supernatants were used for both a (A) lactate dehydrogenase (LDH) assay and an (B) ELISA for measuring the release of IL-1β. Figure 4: Wild type (WT) (blue) and Gasdermin-D knock out (KO) (red) mice (20-25g) were injected with 150 μg of poly IC (LMW) for the priming stage of inflammasome activation and then left for 6 hours. Following this, a range of different concentrations from 10-50 μg of E. coli OMVs (prepared in PBS) were injected intraperitoneally into the mice. After an additional 5 hours, peritoneal (A) IL-1α and (B) IL-1β cytokine levels were assayed using ELISA kits. Activation of TLR2 and TLR4 by E. coli OMVs has been confirmed using HEK-Blue™ TLR cellular assays. 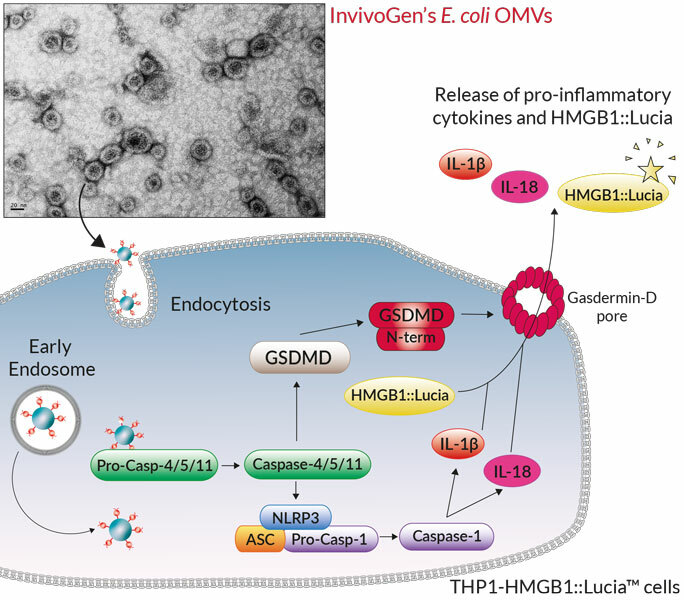 Inflammasome activation by E. coli OMVs has been determined by the induction of pyroptosis in THP1-HMGB1::Lucia™ cells. E. coli OMVs InvivoFit™ are guaranteed sterile. Activation of TLR2 and TLR4 by E. coli OMVs InvivoFit™ has been confirmed using HEK-Blue™ TLR cellular assays. Inflammasome activation by E. coli OMVs InvivoFit™ has been determined by the induction of pyroptosis in THP1-HMGB1::Lucia™ cells. Outer membrane vesicles (OMVs) are small, non-replicative, immunogenic spherical bodies secreted by both commensal and pathogenic Gram-negative bacteria such as E. coli . OMVs contain components of the parent bacterium such as DNA, RNA, peptidoglycan, protein, toxins, and lipopolysaccharides (LPS), which act as pathogen-associated molecular patterns (PAMPs). PAMPs from OMVs interact with pattern recognition receptors (PRRs) expressed on the surface of host cells such as Toll-like receptors (TLRs), inducing both pro- and anti-inflammatory responses; a balancing act that can result in either pathogen clearance or bacterial survival . 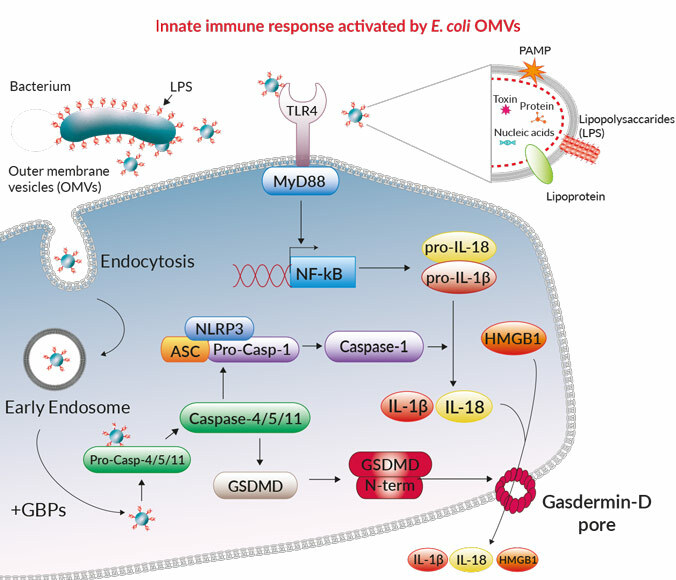 Additionally, OMVs can be endocytosed and deliver their highly immunogenic cargo directly to the cytosol of the host cell, where a number of PAMPs can activate intracellular PRRs and lead to the formation of the caspase 11-4/5 inflammasome . Ultimately, the activation of this complex results in pyroptotic cell death through the action of Gasdermin-D and the release of pro-inflammatory cytokines such as IL-1β and IL-18. 1. Kulp, A. & Kuehn, M.J., 2010. Biological functions and biogenesis of secreted bacterial outer membrane vesicles. Annu Rev Microbiol 64:163-184. 2. Kaparakis-Liaskos, M. & Ferrero, R.L., 2015. Immune modulation by bacterial outer membrane vesicles. Nat Rev Immunol 15:375-387.